A couple of years ago, I came across the charity Share the Dignity and their “It’s in the bag” campaign (https://www.sharethedignity.com.au/christmas-charity/). The idea is that you get either a brand new or very good condition second hand bag and fill it with things most of us take for granted – like toothpaste, deodorant, soap. Daily personal hygeine items that a woman would use. You can then add in things like jewellry, a book, scarf etc. that are there to help a woman feel special and cared for. These bags are then donated and handed out to women in domestic violence shelters, homeless women etc. 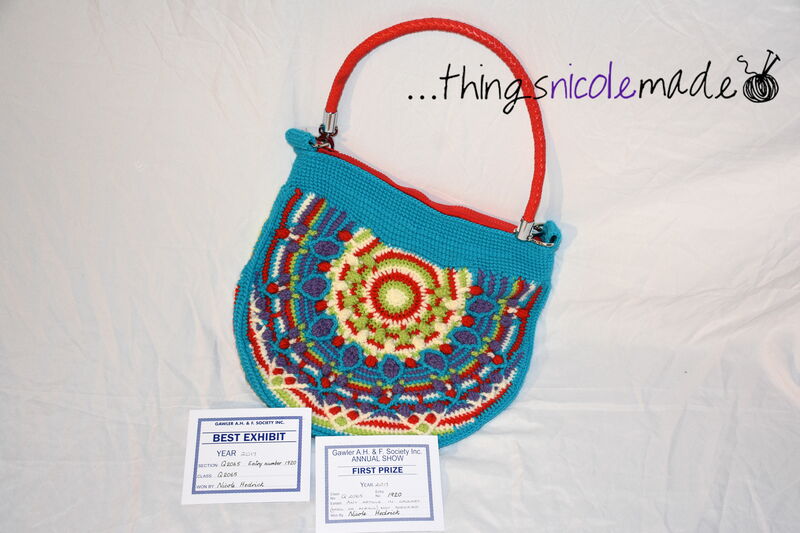 I loved the idea of helping a fellow woman and set about purchasing some of the neccessary items. Unfortunately, that first year, the donation locations were hard to find and in the busyness of the pre-Christmas season, I did not get my bag completed. Last year, however, the donation boxes were located at all Bunnings stores and that was a much more accessible and easy option for me to find! So, I determined to finish up my bag and get it donated. Being a craft minded person, I really wanted to put something in that I had made personally, just for whoever it is that was going to get my bag. I had some lovely mill end yarn that I had picked up from spotlight that I thought would make some lovely patterns with the colours. I must apologise because I can’t for the life of me remember what pattern I used but it worked up fast enough amongst making my other Christmas gifts and I was able to drop my bag off just in time! I love the way it has turned out and the colours – I thought that they were neutralish enough to suit most women. Sadly, when I was photographing it in a rush one morning before school drop off (after which I needed to drop the bag off), there was obviously something red on the floor reflecting on my photos so you don’t get a true picture of the colours but it did turn out lovely. If you are interested in donating to the “It’s in a bag” campaign, it happens around Christmas time. I would recommend starting to get things together during the year so it’s not a big crazy rush at the busiest time of the year for most people. It’s lovely to be able to bless someone and I hope that each donation gives the woman who receives it comfort and hope. My youngest daughter had the most amazing teacher last year! She really seemed to get her and everything about being at school improved. So at the end of the year when it came time to buy her a gift, I didn’t want to just go out and buy her something. 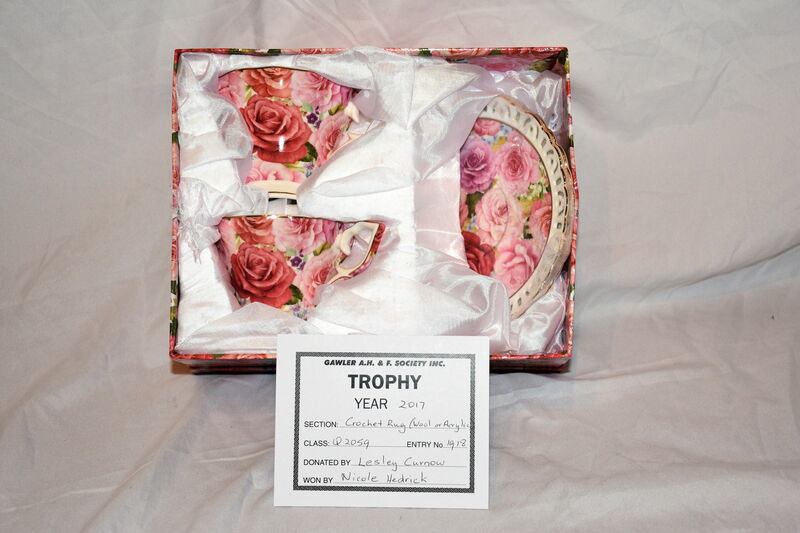 I wanted something special and meaningful to really thank her for the time and effort she put in to my girl during the year. But what to make. That is always the question. It’s hard to find something that someone will actually use and also to judge if they are someone who would appreciate a hand made gift or not. This teacher was going off on an adventure during the holidays to Finland, where I knew it would be cold and snowing! So I decided to make her a cowl. I looked for a pattern I liked and found this one by Little Monkeys Crochet (http://littlemonkeyscrochet.com/herringbone-buttoned-cowl/). I liked the tailored look of it and that it wasn’t too bulky. It also had a bit of a design element with the buttons. I was fortunate enough at the time to be face painting in a Christmas market. I had another lady working with me and during a break, I found a lady selling these beautiful printed wooden buttons at a crazy low price (more than just these slipped in to my cart!). I love the little pop of colour that they bring without being too showy and overpowering. The overall finished product is beautiful. I used “Marvel soft” yarn, so it has a lovely drape and sheen to it. It will also be lovely and warm as there aren’t a lot of holes in it but it’s still thin, so won’t be too bulky up around the face. The teacher loved it and was especially chuffed when she realised that I had made it for her. I hope it kept her warm during her special adventures! 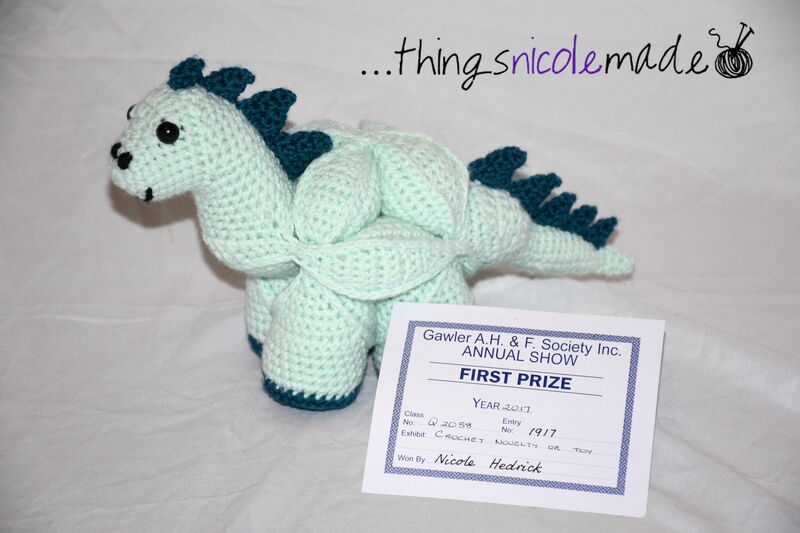 Last year, I cleverly left all of my Christmas present crocheting to the last minute. Well, not really, I just didn’t have the ideas for them until the last minute, which meant I was making everything in a hurry! Once a month, I meet with a group of other like minded people for our crochet group. I really enjoy these meetings. I know none of these people outside of crochet and we rarely meet outside this group (as most of the others live a LONG way from me!). We connect regularly thorough Facebook and these ladies have become wonderful friends over the last couple of years. At the end of the year, we have a special Christmas celebration meeting and enjoy a High Tea at the cafe we meet in. Due to the added cost of this, we haven’t done Secret Santa gifts or anything like that. 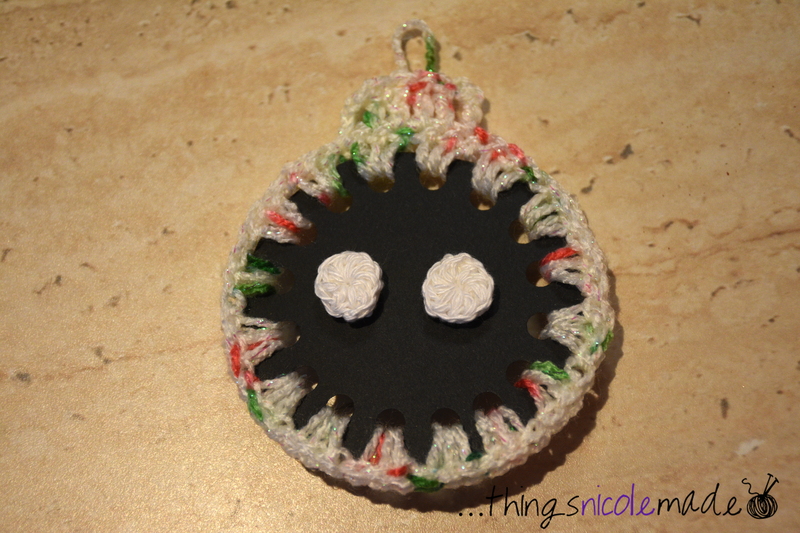 One night when browsing different crochet sites, I came across a lady who had made dangly crochet earrings and put them on these little crochet baubles (like in the picture above). 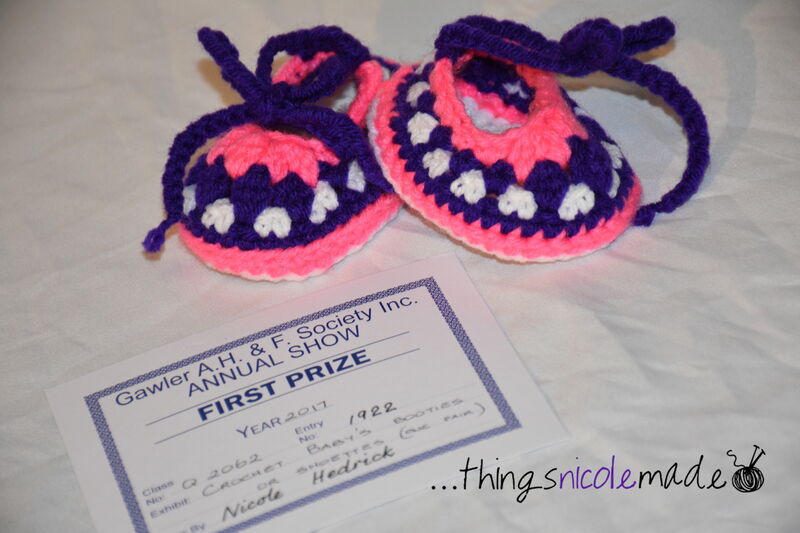 I LOVED the idea and knew that out of all of my friends, my crochet ladies would appreciate these the most. The only problem was, my meeting was not too many days away! I looked for and found a number of dangly earring patterns. I tried a few, but they all ended up rather large and didn’t seem to suit what I had seen these ladies wearing. 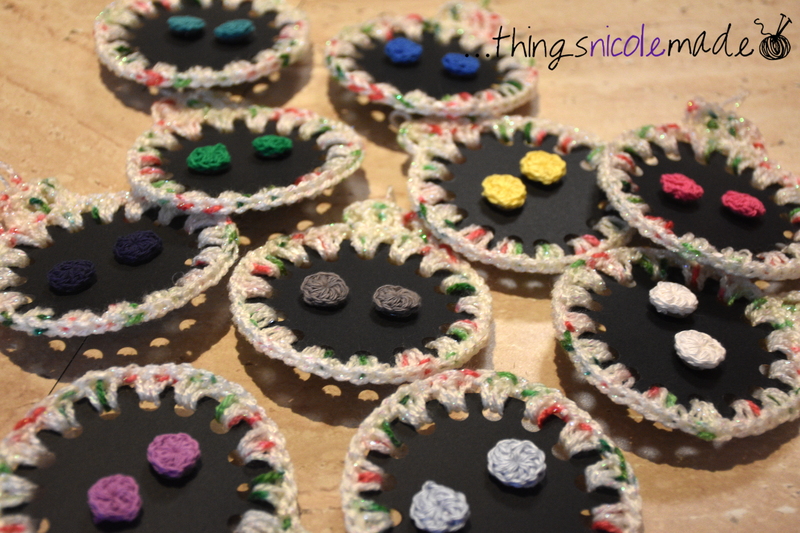 With my deadline looming ever closer, I decided to just make these little round earrings – an adjustable ring with (I think) 12 single crochet in them. Quick, easy and effective! I made up the little baubles and off I went to celebrate Christmas with my friends! The ladies were surprised as we weren’t doing gifts but they were delighted by them and I hope they get good use out of them. Something unique and a little bit different! Last week, I challenged you to finish up something that has had you stuck for awhile. This got me to thinking. I have many unfinished projects, but most of them have been put down just because I’m bored with them or wanting to start something else. But there is one project that has had me baffled for a couple of years. I feel that I am a very experienced crocheter now, so I hate it when I can’t master a crochet technique. It really irks me. That is why I had put down this project. To explain my predicament, I need to start at the beginning. We don’t have a great variety of yarn here. I get a little bit envious seeing all the different yarns that are available in America. Every now and then, one of them hits our shores. The Caron cakes are one of those. We had been seeing these balls of colour changing yarn for awhile before Lincraft brought out their own brand of them. I bought one because I was dying to try this new yarn (I probably shouldn’t say that that ball is still intact in my yarn cupboard!). Not long afterwards, Caron cakes came to Spotlight. Being the good fibre artist that I am, I had to buy one of those as well to compare the two. In my opinion, I much prefer the Caron cake. It is soft and plush whereas the Lincraft brand is a little stiffer and pricklier. But what to make from these balls? I have three of them in three completely different colours. I googled what I could make from them and came up with a few different options. I ended up choosing the Lucky Celtic Infinity Scarf by Left in Knots (https://www.leftinknots.com/home/2017/2/24/lucky-celtic-infinity-scarf) partly because it wasn’t a shawl and partly because it was made in one of the colours I have, so I could really see how the finished product would look. I also loved the fact that the author is left handed, so I knew the pattern would suit my own left handed crocheting! So I began. The first few rows are just hdc, so that was easy. Then you go on to the “Celtic weave” part. In theory, it is just triple crochet, so nothing too difficult, you just need to place them in the right way to get the criss crossing effect. No problem. I’m an experienced crocheter, this will be easy for me to handle. First row, done, fantastic. Next row, yup, looks right. Third row – nope, something’s gone wrong. Frog the row, start again. Nope, still wrong, frog again. Start again, nope, still wrong – where am I going wrong? 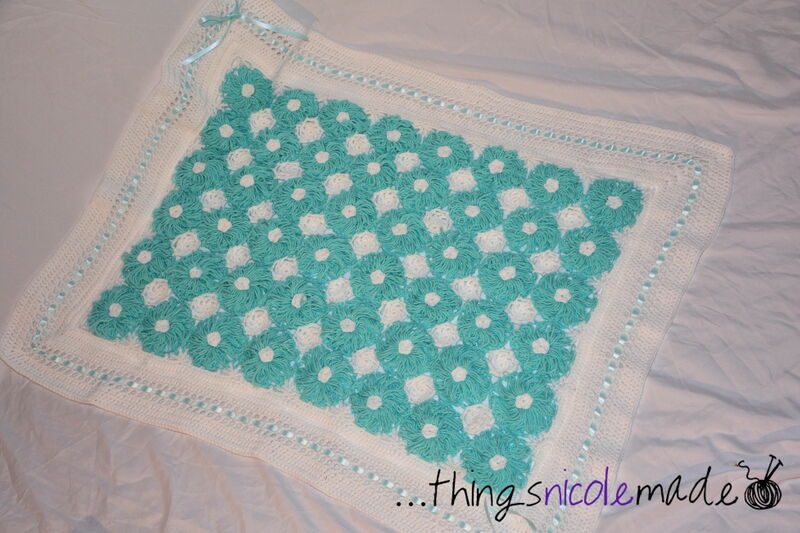 On the pattern website there is a video tutorial for how to do this stitch. I hate watching videos on the internet. I much rather just read a written pattern. But the written pattern just wasn’t working for me, so I knew the only alternative was to watch the video. At the time, it wasn’t practical, so the project got shelved until I had the time to watch. That day just never came. Last year when we went away I decided to take this project again – who knows, maybe just by having had a year or more experience wise might be enough to just pick it up and get it. Sadly, this was not the case. I did the next row and frogged it again several times and finally decided I would have to watch the video. Unfortunately the internet where we were staying was not strong enough to watch the video so the project came home again and went back in the drawer. Forward to this week. I made up my mind that this project was no longer going to defeat me. I watched the video. It didn’t help me! So, I just went with how I thought it should work and how it looked in the picture and I finished it (and I think it looks right!). I love how it has turned out and I’m looking forward to wearing it when it isn’t a furnace here anymore! The bright, rainbow colours will be sure to brighten up a dreary Winter Day. It has curled up a lot in the making, but with a good blocking, it has flattened back out and will be awesome to wear! So now I feel good. Not only have I finished a WIP that has been sitting for a couple of years, but I have finished one that had me completely stumped! That’s a win for January! Life has been so busy this year! The weeks just fly by and before I have a chance to blink, we’re on to the next one. So I apologise for being so slack in my posts. I have a new job this year and it is very on and off and last minute and it’s taking some adjustment! However, in amongst the busyness of life, I am still creating and things are ticking away in the background. I have continued with my sock experiments. With my first pair of socks, it was hard to judge the length of the foot for adding the toe, so I have ended up with one sock that is a tiny bit short (I’m sure it will stretch once I start wearing them – it’s been warm here and socks and flip flops are generally not a look I go for!). So, I decided that my next pair of socks would be toe up and knitted two at a time. I’ve taken both of my girls to the yarn store and they have chosen the yarn for their socks and have been told not to hold their breath for a quick finish! I started with my older daughter’s socks. To make toe up, I needed to learn a new technique – Judy’s magic cast on http://knitty.com/ISSUEspring06/FEATmagiccaston.html. To be honest, I’m on my third sock doing this technique and I still don’t quite get it right unless I have the instructions close by, but I am getting there. I followed the instructions for two at a time socks but I just couldn’t get it to work – my tension was off and it was going to leave big holes in the toes. So, I decided to take it easy on myself and just do one at a time. That seems to have worked well, although I wasn’t able to avoid all of the counting of rows to have them the same, which was my aim. However, I have produced a lovely pair of socks that my daughter can’t wait to wear (she’s been told I have to photograph them before she can wear them!). The yarn was another learning experience. I’m using Jawoll Mille “Luxe Sparkle” sock yarn. It doesn’t have a repeat of colours – anywhere! So, despite the fact that the socks come from the same ball of yarn, they are completely different! The colours are similar but they by no means match (for those that are conscious of wearing matching socks!). I like it, it’s quirky! And, I have lived for a long time with a man who refuses to wear matching socks! Yup, if he pulls matching socks out of the drawer, one goes back so he has an odd pair! Toe up socks definitely worked well for getting the length of the foot part of the sock right, but it still hasn’t solved my problem of knowing how much I can knit of the leg before I need to switch to the cuff so I run out of yarn at the end of the sock and not before. If you have any clues on how to do this, please share! But for the moment my experiment continues. I’m now on my other daughter’s socks and she has decided she wants ones without heels at all, so another knitting experience is being added to my life! I have been knitting since I was a child when my Mum taught me (thanks Mum!). For many years, I have wanted to knit myself a pair of socks. I have even gone so far as to purchase a book about knitting socks and starting a pair but I was using 8 ply yarn (dk weight) and I could very quickly tell that it was going to be too bulky and not work so I put them down, never to be worked on again! In the last few years, the internet and my growing circle of like minded friends has exposed me to the possibility of purchasing sock yarn and has opened doors to where to buy it from. So, one of my intentions when on our great yarn buying trip last year was to buy some sock yarn. I settled on some Schachenmayr “Regia – color” in 4 ply. I bought two 100g balls because I have large feet (size 12) and was worried I wouldn’t get a full pair out of one (and Melbourne is a bit far away to pop in for another ball!). This year, I have finally had a chance to try making them. I downloaded a pattern from the Schachenmayr website and began. I started them a couple of times because the first cuff didn’t look like it would be able to fit over my heel. So, I started again one size up and with my new KnitPro Zing double point needles in a 2.5mm (one size larger than I’d been using). This size was much better and I zoomed along until I was ready to begin the heel. It was here that I discovered my pattern was more guidelines and I couldn’t understand what it was directing. I admit, I nearly gave up. One of the knitting groups I attend is run by a lady with a lot of experience with sock knitting, so I thought I could put them on hold and ask her when our group resumes. But that felt too easy. I dug out my sock knitting book, and googled sock patterns and found a great one from Winwick Mum (http://www.winwickmum.co.uk/2014/05/basic-sock-pattern-and-tutorial.html). Between the two, I conquered those heels and was able to complete my sock! It was a big accomplishment! And here I wanted to take a break. Remember, I’m not good at focusing on one project for too long! Thankfully, one of my friends from my crochet group encouraged me to complete the second sock (thanks Laura!) and I have! And I’m glad I did. Although I made one straight after the other, I’m sure I did it slightly differently – I’m just thankful that they are the same. I think my next challenge will be making two socks at once so I know they’re exactly the same. And making them toe up – I was worried I’d run out of yarn and in the end I could have made them longer ( the top picture shows my remaining yarn!). Then, making socks for my girls, because they both really like them! I can see I have only just begun this journey into cozy toes! New year, new product review! Hi! I hope you all had a lovely Christmas and that the new year has started well for you. I made my husband a knitted jumper for Christmas and this has rekindled my love of knitting. It has also given me a chance to try out a new brand of needles. In Australia, and particularly where I am, there are not a lot of choices of places to buy knitting needles. We have the big craft chain stores of Spotlight and Lincraft and a few small independent yarn stores but none of these are very convenient to my home. The chain store needles are generally fine and have been what I’ve used for all of my knitting life but being connected to the world by the internet has shown me that there are other options out there and I’ve wondered if they might be better. I needed a circular needle to complete my husband’s jumper and was heading in to the adelaide cbd so I decided to pop into The Button Bar (one of the little independents around). As it’s name suggests, they mainly sells buttons, but they also carry a small amount of yarn and some crochet and knitting tools not found elsewhere. I picked up a Knit Pro Zing circular needle. 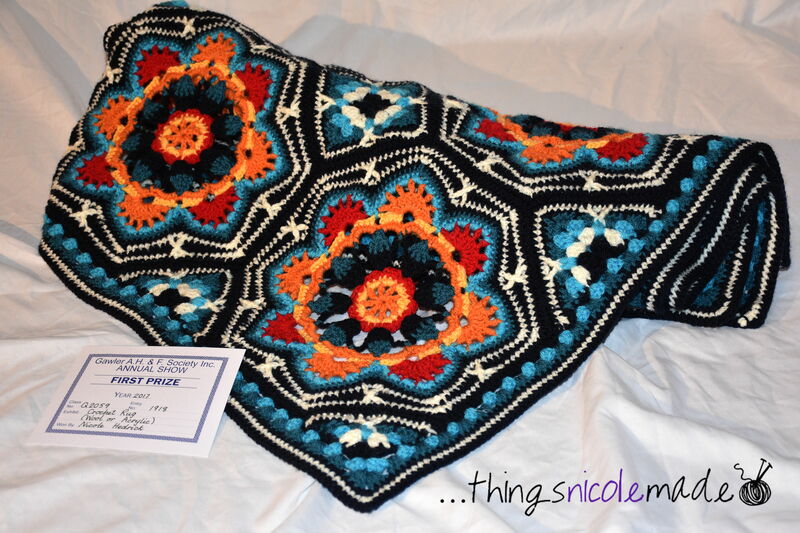 The price was ok and it was colourful (which is always a plus for me!). I brought it home and started using it and was instantly sold. They are so smooth and easy to use. They don’t snag on your yarn at all (I was using 100% wool) and are such a pleasure to use! Once I had finished my Christmas present crafting, I was finally able to get on to those projects that had been calling me but had had to wait. One was knitting socks. I’ve long wanted to try it and finally got around to buying some sock yarn whilst we were in Melbourne. Unfortunately, I did not have small enough double pointed needles. At the time, I wasn’t going near the cbd and was keen to give it a try, so I bought some dpn’s from a chain store. I wasn’t confident when I got them out of the packet – they looked very “production lineish” and quite sharp where they had been cut as they went through the machine but I gave them a shot anyway. 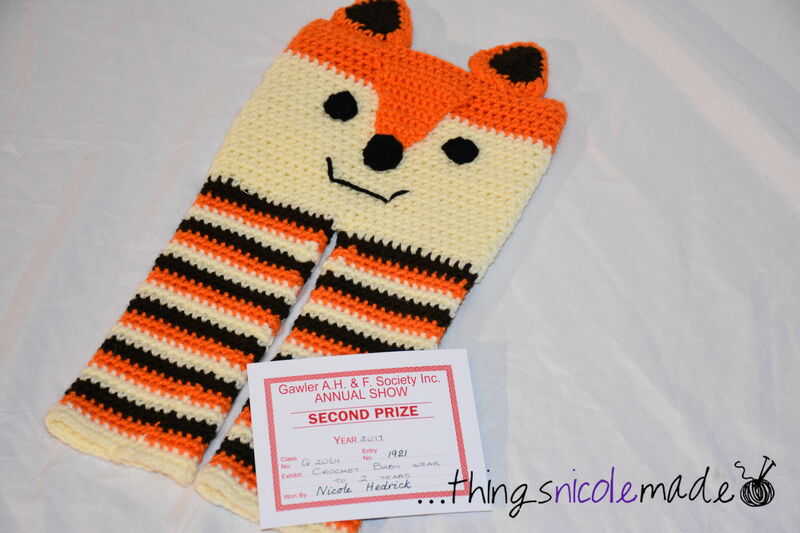 They didn’t catch on the yarn too much but they hurt my fingers – a lot! I knew I couldn’t continue with them, so the next time I headed into the cbd, I visited the Button Bar again! A set of Knit Pro Zing dpn’s has joined my knitting needle family! The best part about these dpn’s is that there are 5 in the packet, so I can work the sock exactly like the pattern calls for (which is great considering I don’t really know what I’m doing). And, they don’t hurt. The ends are slightly rounded and much more gentle on my delicate fingertips. Just like the circular, they are smooth and the yarn just glides around them. My sock isn’t finished yet, but it’s coming along very fast. I can’t recommend this brand enough! It’s so much fun trying something new and very gratifying when it is successful! I believe I have said once or twice that I am not a patient person. Most things I make are small and easily finished in a fairly short period of time. I have made some clothes for small people, but was NEVER going to attempt to make a piece of clothing for an adult. That would take way too much time, making it take years before I finished it. That was until I married my husband…..and started buying his clothes…..and learned how fussy he is about jumpers. I will agree with him that unless you want to pay serious money for a jumper, the ones readily available in store are not particularly thick or warm, and as someone who has to do a substantial amount of walking to get to work, he needs something warm for those cold Winter morning and evenings. So, I set about making him a jumper. I bought some thick yarn, so it would make up as quickly as possible and I started knitting (yes, I knit too!). I am forever grateful that he is a slim man, so I usually have to make one of the sma ller sizes on the patterns and that helps a bunch! 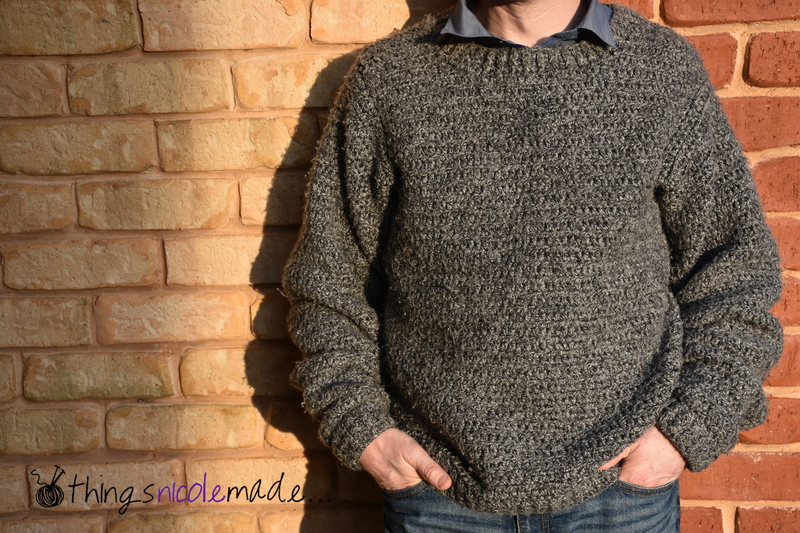 The result was this jumper (I didn’t get a photo when it was first made, so it’s a little loved here!). He was thrilled, and (more importantly) warm. 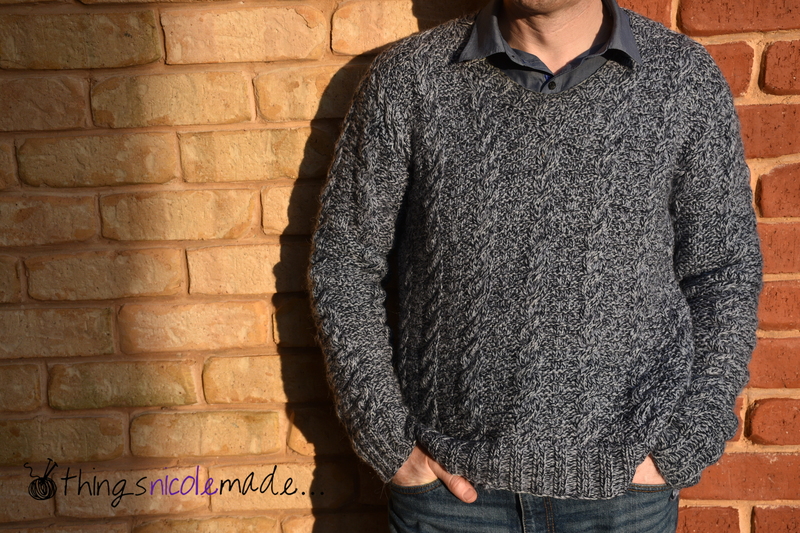 He got lots of comments on this jumper, and it gave me the confidence to make another o ne. Once again, thick yarn, but this time, I chose a more complicated pattern, and attempted to knit cables for the first time. I love this jumper. It would have to be one of my favourites that I have made him. It didn’t go without a hitch. I made up the whole of the front and back and tried it on him and it was WAY TOO BIG. With tears in my eyes, I went through every way in my head that I could possibly make it smaller. The answer in the end was to rip it all out and start again. It was hard, but I’m so glad I did it! The end result is much, much better than it would have been if I had altered it somehow! This one is actually starting to come apart on the neck and cuffs, so I am going to have to learn how to recuff it! (I’m actually excited to learn a new skill!). After knitting two jumpers, I had the thought that crocheting one would be a lot quicker, so I set about doing that. The pattern called for a thicker yarn than I could get my hands on, so I bought dk yarn and just made it with a double strand. This jumper is VERY warm. A little too warm. It’s not my favourite in that it is just so big and bulky but he still wears it with pride (he’s a rare gem!). This year, jumper 1 and 3 were out of the picture for wearing to work (too worn and too warm), which left him with one jumper. So, I decided it was time to make another. 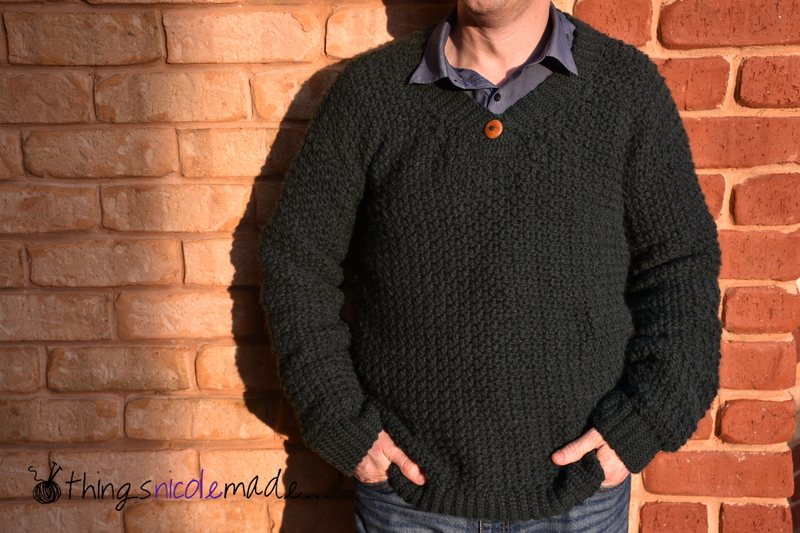 I found a pattern I loved for a crochet jumper, I ordered the yarn from Ice Yarns in Turkey. The yarn was super cheap, the postage was super expensive but it all equalled out to a normal cost in the end and was here in 4 days, which still has me staggered when things coming to me from another state in Australia can take longer than two weeks! Anyway, I made the front and back without too much trouble but when it came to the sleeves, I could see that they were going to be really baggy and awful (I can never get my tension quite right!). So it went in the naughty corner for awhile. My biggest problem was that my husband was always wearing the jumper that I needed to use to compare it to! I finally took an outline of the sleeves so I could work on it without the jumper and decided to just try and fudge it so it was the same size! A couple of weeks ago, I told him that I would need his blue jumper on a weekday to take to the knitting and crochet group that I go to so I could get some assistance with the repairs. His reply was that it was the only jumper he had to wear, it’s cold and I couldn’t have it! I felt that now was a good time to finish the other jumper. I figured out the sleeves and was happy with them, sewed it all together and tried it on him. Unfortunately, the neckline was going to be way too low. I looked at it and had the thought “I wonder if this stitch is forgiving enough that I could just join the yarn in and fill the hole in a little?”. I figured it was better to try that than to start all over again, so I did. I’m thrilled at how it has worked out and (to be honest) that I was clever enough to do it. If I point it out, you can see a slight difference, but on the whole it is not noticeable and it means the jumper is finished now and not back at the start again! 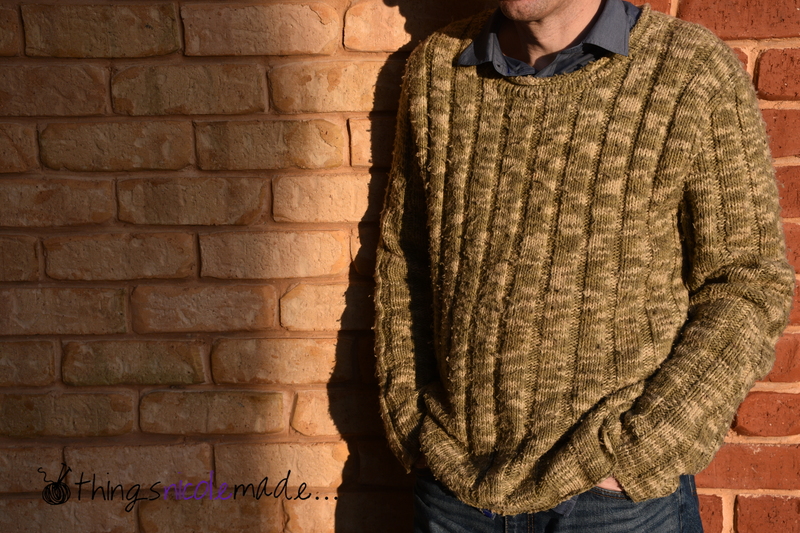 So, my next challenge is to find a nice pattern for the yarn I bought to make another jumper for him at the Bendigo Woollen Mills. And then to really challenge myself – I want to design a cardigan for myself from the ground up! I’ll let you know how that goes!